This Straight Tube Slide mounts to a 6’ to 7’ tall deck height. It can also attach to a Penthouse (SkyBox) that sits on top of your Monkeybars. It's fully enclosed for sliding fun. 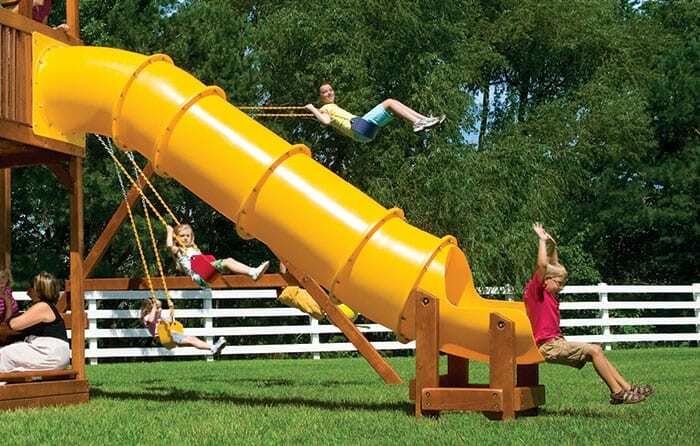 Pricing varies depending on which playset you are attaching it to, see Playset Specialist for details. This Slide is most commonly attached to a Penthouse (SkyBox) on Rainbow's Sunshine, Rainbow, Monster or King Kong Series. It is Super FAST and FUN! Wheee!